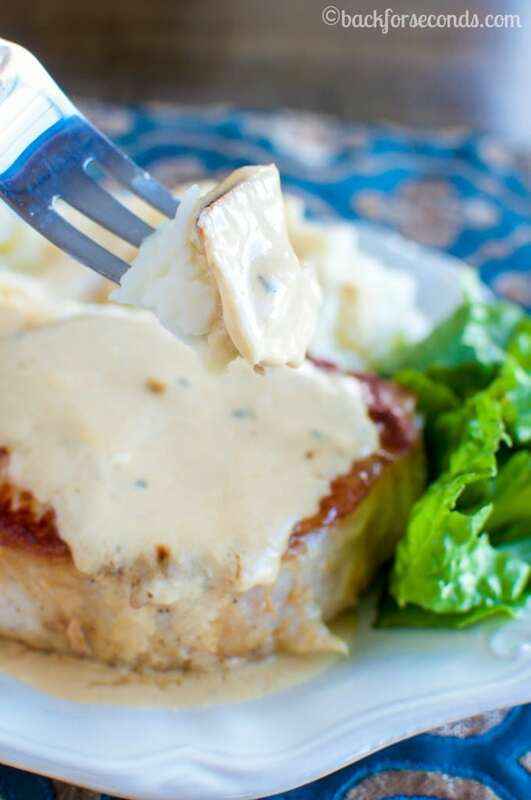 These are the easiest and BEST Pork Chops with Creamy Pan Gravy I have ever had! 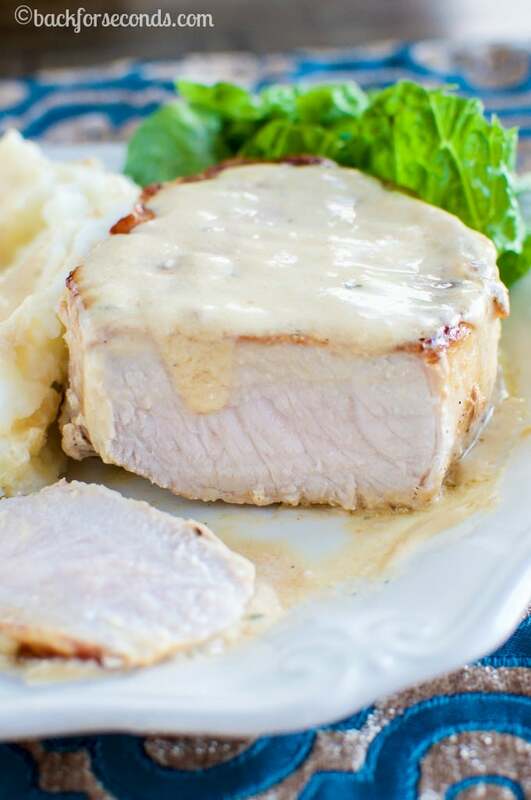 The pork is juicy and so flavorful and the gravy is creamy, slightly tangy, and incredibly delicious! You will make this again and again! I am not a great meal planner. I want to be, but the truth is that most days I don’t even think about dinner until my kids start asking when we can eat. Oops! So obviously, I am in need of lots and lots of quick and easy dinner ideas that I can start at 5:30 and eat at 6:00. I realize that many of you probably need these same kinds of recipes, so I am planing on sharing my favorites with you as often as I can! This pork, you guys. SO GOOD! You know it’s a great recipe when your family asks what’s for dinner and when you tell them Pork Chops with Creamy Pan Gravy and they all cheer, clean their plates, and ask for seconds!! I love the simplicity of this recipe. You probably already have all the ingredients in your kitchen. It’s ready to eat in under 30 minutes, so it’s perfect for busy weeknights, and everyone LOVES it! I like to serve them with mashed potatoes and a salad or other veggie. Enjoy! I adore pork chops, they remind me so much of my childhood. My mom was such a big fan of pork chops done in shake n bake for some reason. We ate it all the time. I swear I was an adult before I realized you could cook pork chops any other way. Ha. I have to try this recipe. It looks amazing. 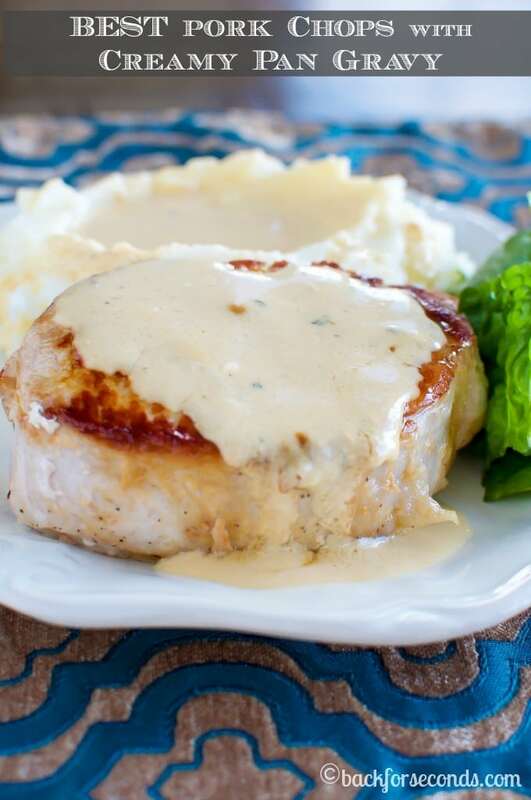 Nothing better than pork chops smothered in gravy. Yum, yum.